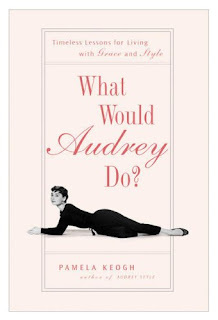 I’m currently in the middle of “What Would Audrey Do?” an adorable and informative book…super cute and the more I read, the more I love. Last night I finished a couple chapters on Audrey’s home style and then on how she traveled. Some great ideas…if only I had a mansion on Paris to decorate or Ralph Lauren’s private jet to fly around the world on! Next chapter: Audrey’s fashion! Now, if only I had that teeny, tiny waist!